Zion Market Research has published a new report titled “Portable Medical Devices Market by Application (Diagnosis, Monitoring, Medical Therapeutics, Fitness & Wellness, and Others) and by End-User (Hospitals, Clinics, Homecare Patient, Ambulatory Care Centers, Surgical Centers, and Others): Global Industry Perspective, Comprehensive Analysis and Forecast, 2018 – 2024”. 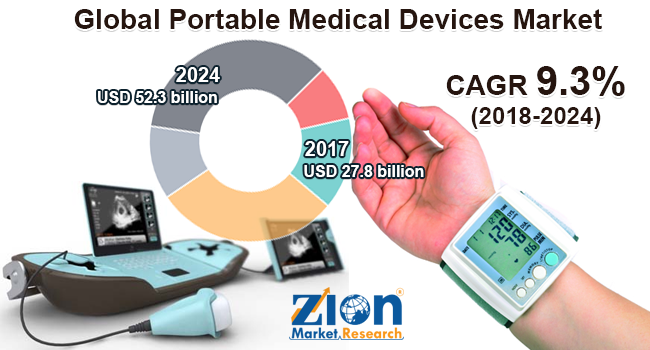 According to the report, global portable medical devices market was valued at approximately USD 27.8 billion in 2017 and is expected to generate revenue of around USD 52.3 billion by end of 2024, growing at a CAGR of around 9.3% between 2018 and 2024. Growing demand for the real-time analysis, diagnosis, and monitoring of the patient are boosting the demand for integrated portable technology. Furthermore, wireless technology embedded in portable devices has enhanced the situation handling capabilities of the healthcare equipment. This has resulted in the increase of mobility of the patient. Additionally, allowing the access of patient data through various platforms has increased the opportunities for the portable device market. The global portable medical devices market is primarily driven by growing population base living in remote areas. This has resulted in the upsurge need for advanced and portable healthcare equipment. In addition, growing demand for emergency healthcare services which includes medical transport, ambulances, and helicopters is estimated to propel the growth of the portable device market over the given period of time. Portable devices are well suited for geriatric population base, who may feel hectic while traveling back and forth for treatment procedures. Growing demand for military treatment is further driving the global portable device market. Additionally, smart wearable devices are trending in the global market. However, comparatively higher prices of portable medical devices as compared to the conventional ones may affect the growth of the market in long run. Nonetheless prominent investment in portable medical devices by the government along with the introduction of portable devices for various aspects which includes urological, cardiovascular, neurological, and many others are likely to disclose the new platform for portable medical devices market in the near future. The portable medical devices market is segmented on the basis of application as diagnosis, monitoring, medical therapeutics, fitness & wellness, and others. By application, monitoring is expected to cover the largest market value share in portable device market. Based on end-user, the portable medical devices are segmented as hospitals, clinics, homecare patient, ambulatory care centers, surgical centers, and others. By end-user, the hospital segment is anticipated to be the prominent segment. North America, Latin America, Europe, Asia Pacific, and the Middle East & Africa are primary regional segments of the global portable medical devices market. North America is expected to remain the leading region over the forecast period in the portable medical devices market. North America is likely to witness prominent demand for portable medical devices especially in the U.S. North America is anticipated to be followed by Europe. Moreover, Asia Pacific is expected to be the significantly growing region for portable medical devices market during the forecast period. Moreover, the Middle East & Africa and Latin America are also estimated to show low to moderate growth for this market in the years to come. Some of the key players in the portable medical devices market include among GE Healthcare, Covidien Plc., CareFusion Corporation, Philips Healthcare, Texas Instruments, Natus Medical, Medtronic, Roche Diagnostics, Samsung, Qualcomm, and others.